Time-limited transit passes for the upcoming 2018 PyeongChang Winter Olympics have been launched, the government announced Thursday. The passes, which the officials said are aimed at aiding those visiting Gangwon Province for the Winter Games, have been launched jointly by the Ministry of Culture, Sports and Tourism, Korea Tourism Organization and Visit Korea Committee. Three types of passes are available: two for foreign visitors and one for Koreans. 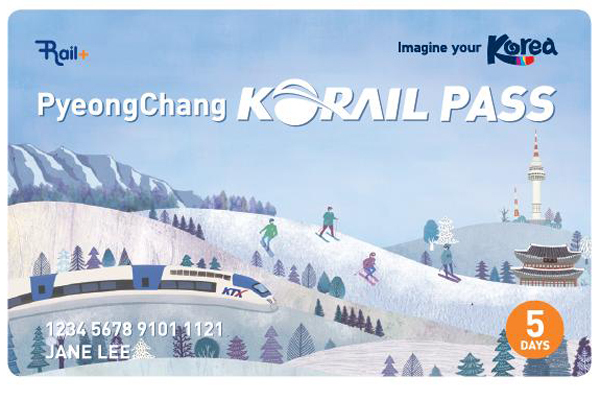 PyeongChang Korail Pass can be used from Feb. 1 to March 25, and are available as a five-day pass and a seven-day pass. The passes allow the user to use all trains in the country -- except subways, the airport railroad, Super Rapid Train and sightseeing trains -- during the prepaid period, along with access to tour programs for major cities Seoul, Busan, Incheon, Gyeongju, Daegu and Jeju Island. The five-day pass costs 168,000 won ($155) and the seven-day pass costs 195,000 won. The credit card-type passes are available now until Jan. 10 and the paper-type passes will be sold from Jan. 11 to Jan. 31. For more information, refer to http://www.letskorail.com. The second type is the Korea Tour Card, which began sales in January and will be sold through the end of this year. It allows foreign visitors to use public transportation with a prepaid account balance of up to 500,000 won. It also offers various discount benefits. For more information visit www.koreatourcard.com. A separate pass exclusively for Koreans will be sold from Jan. 3 to March 31. The holder of a three-day pass or five-day pass will be able to ride the high-speed KTX train from Seoul to Gangneung, Gangwon Province, and receive other benefits. The passes are 100,000 won for three days and 168,000 won five days.